2) Talk to your friends and see if anyone has been to a dude ranch before; a former guest will have a better handle on the reality of the experience than any website. 3) Then check the ranch website: it will answer a lot of basic questions and offer pictures of accommodations, facilities, etc. 3) Check the ranch’s reviews (on sites such as tripadvisor or Ranchweb). 4) Ask plenty of questions: What is the terrain like for riding? How is the riding program set up for ride size, ability, instruction? How are the meals organized: family style, buffet, with kids, without kids? What is the food like- typical breakfast, lunch and dinner? And what other activities are there to do if we get tired of riding? Times have changed since the days when the dude ranch cook simply fired up the campfire and then served guests with a plate of beans and brisket. Don’t get us wrong: we love cookouts. But as with contemporary cuisine everywhere, the dude ranch dining room has adapted to its share of trends. Now you can usually get low-sodium, low-fat, and even get vegan or other special menus (upon request). And some dude ranches go way above what you’d expect. Take TRIPLE CREEK RANCH, in Darby, Montana. 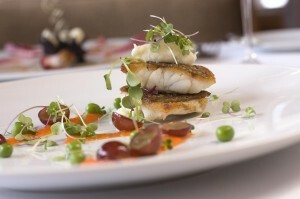 Here, dinner is a four-course event (prepared by a French Institute-trained executive chef). Of course, house wines are included, or guests may choose to add wine pairings from the ranch wine cellar (and how many dude ranches can boast such a cellar?) featuring premium wines from more than a dozen countries. In a dining room with dramatic views of the Bitterroot Mountains, Triple Creek guests are treated to wholesome breakfasts, healthful lunches, and gourmet dinners–even tasting menus. They also have a Chef’s Table giving you an insider’s view of the ranch’s high-tech kitchen. After dinner, nibble on delights from the cheese cart, which include, says the website, “cheeses from the affineurs Hervé Mons, Randolph Hodgson and Luigi Guffanti”. And while the attire for guests is dude ranch casual, the lodge’s dining tables are set with crisp, white tablecloths and flickering candles. It all meets the standards demanded by membership in the exclusive Relais & Châteaux (the ranch has been a member since 1996). More ranch dining: Another option for elegant dining is Wyoming’s Brooks Lake Lodge; for dinner, the lodge chefs prepare a three-course meal using the freshest ingredients and a regional flare; the menu changes nightly and is always followed by a dessert prepared by their pastry chef. For great Southern BBQ rib and chicken cookouts, plus homemade soups, breads, and pastries, visit Clear Creek Ranch in North Carolina’s Blue Ridge Mountains; it’s open from April through December. When you want to really explore and head deep into Canada’s backcountry, there are outfitters ready to show you the way. Some, like Alberta’s Warner Guiding and Outfitting Ltd. (shown in photo, above), and Tsylos Park Lodge & Adventures, have been in business for years. Others, like Tod Mountain Ranch, in British Columbia, are brand new. Tod Mountain Ranch is a small, cozy facility accommodating up to 16 guests in a setting that is both luxurious and rustic. Buildings have a natural look to them and the services and amenities are high quality with a touch of luxury. “Our cabins have all the comforts you would expect to find in a luxury hotel,” Tracey adds. 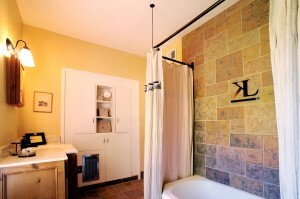 Each cabin has a private bathroom and is furnished with custom-designed log furniture and and high-end amenities. Tsylos Lodge (pronounced sigh-loss) has been around since 1957, set at wild Chilko Lake in British Columbia. 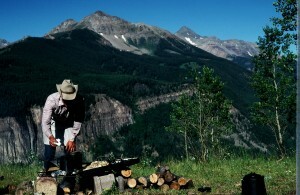 It offers wilderness adventures from fully guided fly-fishing trips to pack trips and grizzly adventures. Warner Guiding and Outfitting Ltd. has both in-town rides (ideal for those with just a day or so), plus longer backcountry trips along the Bow River, or up onto Sulphur Mountain. “Our backcountry rides are perfect for people of all ages and abilities, who have a little more time to spend in the Rockies with us,” contends Jill. They offer tenting or lodge stays from two to six days and horseback packtrips deep into the heart of Banff National Park. Warner’s specialty trips, dubbed Holidays on Horseback, offer a number of interpretive trips each summer featuring leading authorities on wildlife and their habitat, environmental issues, conservation, mixed with both fun and history. Choose topics like Mountain Photography or Year of the Grizzly. One added benefit to a Holiday on Horseback is that you’ll know that you’re helping the local environment: a portion of your trip cost is donated to continuing wildlife research and conservation in Banff National Park through the University of Calgary Grizzly Study, the Rocky Mountain Elk Foundation, and the Friends of Banff programs. You’ve probably heard about Twitter, the messaging service that sends “tweets” or messages of up to 140 characters in length. It’s all the rage for keeping up on the latest articles and posts on blogs (like us—the Ranchweb Dude Ranch Blog). But should dude ranchers, and dude ranch lovers, take up Twitter? Well, it depends. When it comes to influence, applications like Twitter can’t be ignored, certainly (you didn’t ignore the Internet, did you)? Time will tell if Twitter becomes as important as, say, email. But influence is not just about numbers–it’s about being one of the (and reaching) early adopters. And that can help in any business, including dude ranching, and with getting the latest in travel information. Thing is, when you tweet, you only reach the people who have elected to follow you. So if you’re interested in hearing when we’ve posted new stories on the blog, become a Twitterer. So if you just want to share thoughts or story ideas with us, well then, send us a note via Twitter at @calgrl. Sometimes you just want to have a relaxing, growups-only kind of vacation. Ride quietly through an aspen forest—without the kids. And then get pampered and indulge yourself a little. That’s where a luxury outfit like Echo Valley Ranch & Spa comes in handy. Echo Valley has a real “East-meets-West” kind of vibe; one of the owners hails from the world of west coast tech, the other hails from Thailand. So you get a real cultural fusion: loads of services (or apps), plus warm hearted, low-key elegance. It’s all backed by spectacular vistas and loads to do. Raft down the Thompson River, lope horseback across a high prairie, wet a line on the ranch’s own private trout pond, or try some fly-in fishing—landing on floats in the breathtaking seclusion of a Cariboo mountain lake. Oh, and then there’s the spa: with traditional Thai massage, Royal Thai treatments like herb steam baths, facials, and wraps. Check it out, some 30 miles from Clinton, British Columbia. 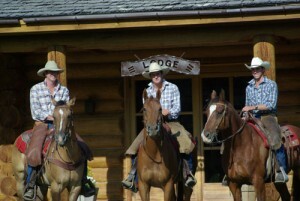 More luxury ranches: Siwash Lake Ranch, also in British Columbia, is a top-notch wilderness hideaway “for people who seek the finer things in life”. You can choose to ride 80,000 acres with or without a guide, or check out the superb fishing, nature-based activities, spectacular scenery & outstanding service. Children welcome in summer. Three Bars Cattle and Guest Ranch, outside Cranbrook, British Columbia, calls itself a small ranch with big ranch amenities (including heated pool and hot tub, indoor riding arena, fitness center, and fully equipped business center). With snow still on the ground in some parts of the U.S., it may seem early to start planning a summer getaway to a Canadian ranch. But early birds can get the best choices and some great deals. Let’s start with British Columbia; B.C. 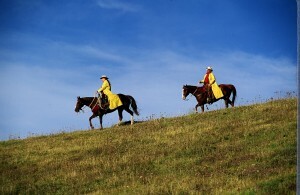 has a wide variety of guest ranches, from traditional to high end, and Canada travel can be a great value now. Take the Three Bars Ranch (shown at left), owned by the Beckley Family and nestled up against mountains and near the St. Mary’s River. Built in 1989 of massive logs, the main lodge and 21 cabins blend modern amenities with classic European styling. Riding is big here. Three Bars Guest Ranch has more than 110 head of horses and their horse-to-guest ratio is over 2-to-1, so they can surely find a horse to suit any rider’s ability and experience level. Besides a world-class horse training facility, you can enjoy tennis and sport courts and a heated pool and hot tub, or try hiking, mountain biking and rafting (among many activities). But mostly, its just drop-dead gorgeous. “Three Bars Ranch is set in the crown of the continent and is truly one of the most beautiful places on earth,” says April Beckley. “With over 75,000 acres to roam there is literally no end to the possibilities for you to explore.” They often run internet deals—check their website soon. More B.C. ranches: Don’t forget to check out Sundance Guest Ranch, south of Ashcroft, for great riding and hospitality. And for a fabulous setting and the opportunity for great adventures, try the Tsylos Park Lodge, 200 miles north of Vancouver. Canada has a long history of both hospitality and ranching, especially in Alberta, British Columbia, Nova Scotia, and Quebec. No matter what you’re looking for in northern-climate ranches, Canada has so much to offer: amazing scenery, friendly and welcoming people, good prices and an exchange rate that has eased a bit in recent weeks (currently $78.8291 US Dollars is equal to 100 Canadian Dollars). Its coastal province to our northwest, British Columbia (B.C. ), has a wide selection including some of North America’s larges and oldest cattle ranches. I just got off the phone with Tyler Beckley, the president of the British Columbia Guest Ranch Association (BCGRA) and he gave me a good overview of everything from traditional dude & guest ranches to high end spa ranches. We list information on six British Columbia ranches on the Ranchweb site: the luxury-oriented Echo Valley Ranch & Spa; the world-class and swanky Siwash Lake Ranch; the family and riding-focused Sundance Guest Ranch Ltd; the lovely, amenity-rich Three Bars Cattle & Guest Ranch (run by Tyler Beckley and his family); the brand new Tod Mountain Ranch; and the Tsylos Park Lodge & Adventures located in pristine wilderness. B.C. will be thrust into the world spotlight for the 2010 Olympic Games to be held at Whistler, so you can beat the crowds and visit B.C. this summer. And elsewhere in Canada, there’s the Warner Guiding & Outfitting, Ltd. in Alberta and the place to go for wilderness tenting pack ridesor a rustic backcountry lodge ride; the fly-in Crown Jewel Resort Ranch in Nova Scotia for flying and fishing; and the horse-lovers’ paradise of Ranch 4 Saisons Guest Ranch & Spa Adventures in Quebec. “With the expansive wilderness still available to us in Canada it is becoming the place to come and play,” says Tyler. “If you enjoy the truly unique culture yet want all of the comfort of travel to a country that speaks English and is safe, we’re a good bet,” Tyler Beckley continues. 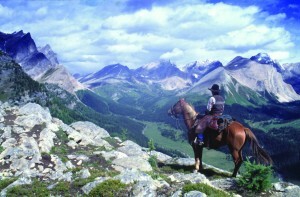 In a few days, we’ll highlight individual ranches in Canada. Stay tuned! 1) What are your rates and what is included? 2) What is your tipping policy (gratuities aren’t always included in the rates)? 3) Are there special rates for non-riders? 4) Are there discounts for off-season visits? 5) What is the minimum length of stay required, if any? 6) Are there special rates for families, children, seniors, or corporations? 7) Besides state and local taxes, what else do rates not include? 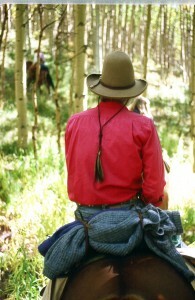 For an extensive list of dude ranches, and links to their details, check Ranchweb.com. She notes that there’s also a new patio and cook-out area that is “the perfect setting for a reunion or wedding reception–in fact, we have one of those coming up on March 14th. A local cowboy is marrying his sweetheart and arriving at the ranch in a horse-drawn carriage.” Cool. They’ve also updated their bathrooms-check out the photo at right, below. 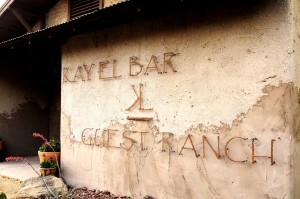 Sounds like the The Kay El Bar is a good example of how a historical dude ranch can modernize without “selling out.” Take a look at their new website; it reflects how they give people an authentic Western experience. More ranch news in Arizona. You might think about getting a break for spring break by staying at Hidden Meadow Ranch where children, 11 and under, stay free the third night. And at Stagecoach Trails Guest Ranch, they are offering a special discounted rate for a 3-night stay between: March 21-April 1 or April 27-May 3, 2009. Careful readers of the Dude Ranch Blog know that we have just debuted a new design, thanks to our WordPress host. Yep, we’ve got all the bells and whistles now: Tags, Trackbacks, and lotsa cool Widgets. More importantly, the new design is easier to read and quicker to navigate. The key thing to remember, however, is that we’re here to serve you, the Dude Ranching community: ranchers, travelers, and ranch job seekers. It is our firm belief that life is good in ranch country, and we’re here to share that message. We’re also here to help bring more travelers to dude ranch country. We do that by unlocking the secrets to planning the perfect ranch vacations and offering up handy tips and useful information. And finally, we’re here to let ranchers know about what’s going on in this exciting (and ever-changing) industry. It’s a tall order, and we can’t do it without your help. So, please, let us hear from you. Tell us how you like our new design (or what you’d improve), what stories you’d like us to cover or what important information we should be passing along to all of our readers. You can leave a comment or send us an email. Just don’t be a stranger!